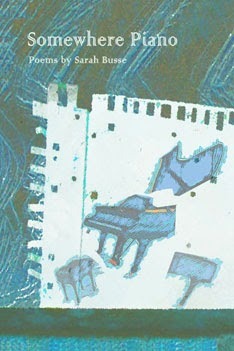 In Somewhere Piano, her first full-length collection, Sarah Busse traverses the domestic spaces of motherhood with an unapologetic, critical eye and a polished poetic voice. Her poems deconstruct an apparently average, suburban life, finding and celebrating the lyric in the everyday. Busse’s impeccable use of meter and rhyme, as well as her careful attention to word choice, lend her work a quality of patient preparation and sophistication. Her lines flow as naturally as the birdsong she extols every few pages. Somewhere Piano is closely attentive to nature: every glance out the kitchen window is potentially a lyric moment, though Busse also explores darker issues against that backdrop. Unafraid to explore conflicting emotions, Busse moves through anger, fear, and enchantment in Somewhere Piano with metrical ease and lyrical grace. Busse’s poetry displays a certain tenacious independence, and she is unapologetic in her distinctive observations of everyday life. Sarah Karpovich is a recent graduate of Loyola University Maryland with a Bachelor’s in Writing and Spanish. She has recently been published in The Journal and River & South Review. She currently lives in Baltimore and works at a small (but energetic!) nonprofit.